A leading environmental writer looks at the unexpected effects-and possible benefits-of a shrinking, graying population. Demography is destiny. It underlies many of the issues that shake the world, from war and economics to immigration. No wonder, then, that fears of overpopulation flared regularly over the last century, a century that saw the world’s population quadruple. Even today, baby booms are blamed for genocide and terrorism, and overpopulation is regularly cited as the primary factor driving global warming and other environmental issues. Yet, surprisingly, it appears that the explosion is past its peak. Around the world, in developing countries as well as in rich ones, today’s women are having on average 2.6 children, half the number their mothers had. Within a generation, world fertility will likely follow Europe’s to below replacement levels and by 2040, the world’s population will be declining for the first time since the Black Death, almost seven hundred years ago. In The Coming Population Crash, veteran environmental writer Fred Pearce reveals the dynamics behind this dramatic shift. Charting the demographic path of our species over two hundred years, he begins by chronicling the troubling history of authoritarian efforts to contain the twentieth century’s population explosion, as well as the worldwide trend toward the empowerment of women that led to lower birthrates. And then, with vivid reporting from around the globe, he dives into the environmental, social, and economic effects of our surprising demographic future. Now is probably the last time in history that our world will hold more young people than elders. Most fear that an aging world population will put a serious drain on national resources, as a shrinking working population supports a growing number of retirees. But is this necessarily so? Might an older world population have an upside? Pearce also shows us why our demographic future holds increased migration rates, and reveals the hypocrisy at the heart of anti-immigrant rhetoric in the developed world: the simple fact is that countries with lower birthrates need workers and countries with higher birthrates need work. And he tackles the truism that population density always leads to environmental degradation, taking us from some of the world’s most densely packed urban slums to rural Africa to argue that underpopulation can sometimes be the cause of environmental woes, while cities could hold the key to sustainable living. Pearce’s provocative book is essential reading for anyone who wants to know what demographics tell us about our global future, and for all those who believe in learning from the mistakes of the past. 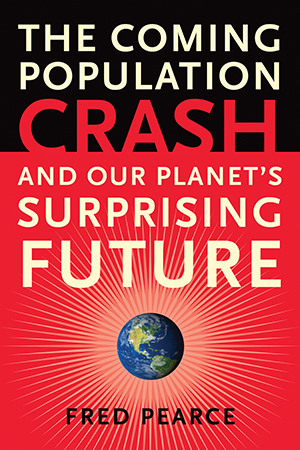 "[A] fascinating analysis of how global population trends have shaped, and been shaped by, political and cultural shifts…Highly readable and marked by first-class reportage." "Consistently interesting, informative and inspiring reporting."